Field trip was to the Scenics shop at WGBH-TV studios, Boston, Massachusetts. I've had inquiries regarding the mechanism of the caster lift mechanism. 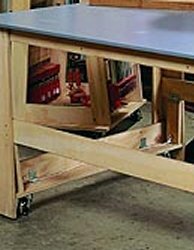 I happened across a picture of the assembly table and grabbed pictures of the lift with the casters up and with the casters down. They're a little grainy because I wanted to display as much detail as possible. The casters are down, therefore the table is up and can be moved around. The casters are up, therefore the table is down and is immobile. As you can see on the left, there is a board which runs across the width of the end stretcher (on each end) and which is hinged to the stringer and to which the casters are attached. The hinge permits the casters to be pivoted up away from the floor. When the end of the table is lifted and the hinged caster assembly pivots down to the floor, two side plates, seen retracted in the picture on the right, which are hinged to the leg drop down to block the caster assembly down and keep the casters in contact with the floor when wheeling the table around. 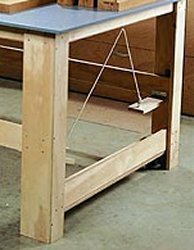 The string is used to pull up the side plates when mobility is no longer needed, but is incorrectly installed in this picture. The string would only be taut, as shown, when the locking plates are down.